“That’s a turnover!” head coach Joe Nizich shouts, his voice echoing through Varsity Stadium as an errant pass sails out of bounds. He shakes his head and paces down the sideline, exasperated. The Varsity Blues men’s lacrosse team lines up and resets the drill. “We have to hold on to the ball!” Nizich yells, and as the whistle sounds, the team restarts the drill. The whistle sounds again, and again, and again. 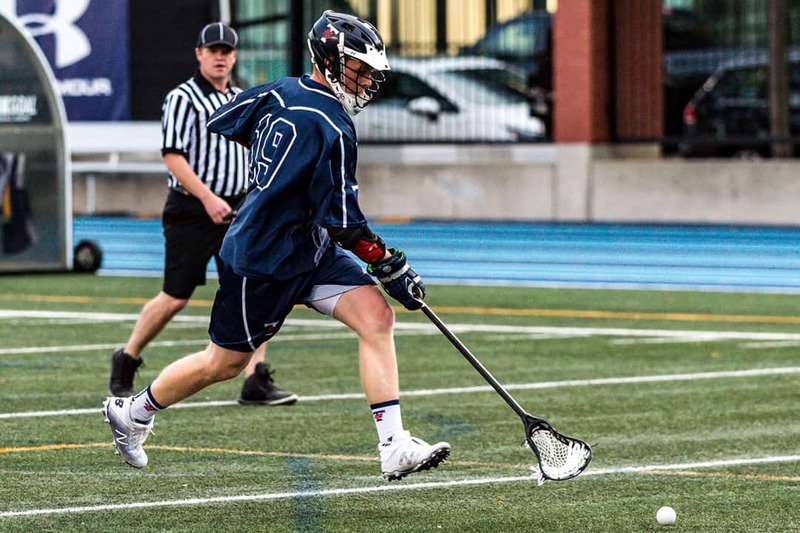 Just like it has nearly every day since late August, all in preparation for the November 9–11 weekend when the Blues host the Canadian University Field Lacrosse Association (CUFLA) championship, the Baggataway Cup, for the first time in their program’s history. Baggataway. The word on everyone’s lips since it leaked in early spring that U of T would be hosting the tournament. Baggataway, “the Creator’s game” — the game played by the Indigenous peoples of this land that has come to be known as lacrosse. Baggataway, the final weekend of the CUFLA men’s lacrosse season. Play like the score is tied; it’s a common refrain in team sports. Imagine the next goal as the winning goal. In the first game of their season, it’s a lesson that the Blues have yet to learn. A game that seemed certain at halftime ends closer than it needed to. On this night, the talent on the Blues roster makes the difference. They win the game, but as they get back on the bus and fight through traffic to arrive home in the early hours of the morning, they know that, in the coming weeks and months, talent alone will not be enough. The Blues are down big time. They’ve given the last 72 minutes of gameplay at home to Brock. Through the bitterly wet and windy night, the Blues have fought hard, but there’s only eight minutes left and they’re going to lose this game. A timeout is called and the team huddles together with the coaches. The team comes together again, huddling close. “Eight miles, boys!” a reference to former captain Jonathan “Rudy” Rudyk’s favourite method for keeping time. There’s some laughter and a few grins, then on the count of three, “Blues!” rings through the huddle, through the wind and rain. There’s a sense of togetherness and a sense of family. There’s no Hollywood ending to this game. No emotional comeback. No last-second winner. There have been some of those in past games and in games to come; but not tonight. The men’s lacrosse team has a group chat, as almost every varsity team does. It’s a space to talk about practice, workouts, academics, and general team banter. It’s a space all of their own, away from coaches, and trainers, and doctors. A place to tease and support each other, it’s a virtual locker room. On September 10, a different message is sent in the group chat. It is a message that will dramatically alter and come to define the season. Coach, former captain, and forever friend Alejandro Duque passed away the day before. The shock and heartbreak that the players feel is beyond words, beyond comprehension. Senior players had been teammates with Al; they had leaned on his experience, been motivated by his burning passion, and come to love him as a brother. They can’t make sense of it. He was so young, so vibrant, and so excited for the next chapter of his life. The first-year players, most of whom hadn’t met Al, don’t know how to react, only understanding that Al’s loss was a massive one. That week, practice is tough. No one has the words to describe the hole that is left in the heart of the team. No one wants to practice, and yet being there, together, is comforting. The one thing that unites the team, that unites every player on the roster, is a love for lacrosse. They take comfort in a crisp pass and an extra effort to get a loose ball. They take comfort in celebrating a particularly outrageous goal, and a stellar defensive play. They take comfort in the sport they love, and it is healing. The team attends Alejandro’s celebration of life later in the week. Generations of Blues lacrosse players come to say goodbye. It is emotional in many ways. There are many tears, but nearly as many smiles. In a time of such sorrow, there is a sense of family. “Power, do your stretches!” Darren “Blondie” Elliott shouts over his shoulder. “You do your stretches!” Sean Power yells back, mocking him. The pair go on like this for a few more moments, shouting at each other and bickering like an old married couple, much to the amusement of the rest of the team. Thing One and Thing Two. Inseparable off the field and leaders on it. Both joined the team the previous year; Blondie, a silky smooth attackman, and Power, a tenacious midfielder. An offensive midfielder last year, Power selflessly moved to the defensive side of the ball for this season. There’s no glamour in being a defensive midfielder in field lacrosse. No goals or fancy tricks. No six-foot long pole to wield like a broadsword. It’s a hard, heavy job between your marked man and the ball-carrier. The constant running, vicious body-checking, and fear of making a mistake and having to fish the ball out of your net. But the team comes first, and Power’s sacrifice has ensured a strong and dependable defense. At their best, the Blues defense frustrates, leaving their rivals bruised, battered, and struggling to score. As darkness descends around Varsity Stadium, the bright lights shine down on the Blues as they warm up. Everyone on the team has their own pre-game ritual. Some spend time alone to focus. Others exchange lighthearted banter and shoot on the net until the coaches call them in. The Blues always find McMaster a difficult opponent. Although unable to match Toronto’s talent, McMaster never fails to match their intensity. This game is no different. Heading into the final 20-minute quarter, the Blues are losing by a goal. In a season filled with such promise — and with the ultimate goal of lifting a trophy at season’s end — losing to McMaster at home would be devastating. With less than 10 minutes left, first-year attacking midfielder and graduate student Nick Pison scores his second of the game to tie things up. A diamond found in the intramural rough, Pison has been an offensive standout for the Blues. But now at five minutes and counting, Mac once again takes the lead. “No more,” Gabriel Lisus-Lean says. Those two words are simple enough to understand; they are the ethos of defense. Do not break, do not even bend. Give everything you have in these final minutes. Whatever it takes, hold. This is defensive coordinator Lisus-Lean’s fourth year as a coach, after playing four years for the Blues. Eight years with the program, and time and time again, he’s mentioned the dream of playing a playoff game at Varsity Stadium. The Blues are guaranteed that game at Baggataway, but Lisus-Lean is well aware that with the execution the Blues are showing tonight — that game could turn ugly. CUFLA abides by international rules: four 20-minute quarters. But the fourth quarter of the game against McMaster isn’t going to be won or lost on September 30 alone; it is either won or lost during August training camp and every practice thereafter. At the end of every practice, strength and conditioning coach Dr. Alex St. Pierre spends 10 minutes putting the Blues through brutal conditioning exercises that leave them gasping for air, legs leaden beneath them. But it is these 10 minutes every day that give them the mental fortitude and physical ability to play the way they do in the final five minutes against McMaster. With less than two minutes to go, Barney scores to tie the game. In the final minute, Barney finds Blondie, who buries his decisive second of the game. The Blues win. Rain is falling and the temperature is dipping dangerously close to zero; these are some of the only constants of October lacrosse. It’s halftime and the Blues are huddled together. They’re in London, taking on the Western Mustangs. After hours on the road, the Blues have come out flat. The coaches are seething, as the Blues have failed to make a simple play and they’re being punished for it. Lacrosse is a brutal game. Historically, Indigenous peoples used this sport as a war game. Entire tribes would compete against each other on a scale scarcely imaginable, with estimates ranging from 100 participants to 100,000. Today, only nine men and a goalie take the field at a time, and although it is no longer a war game, the stakes are still high and the play is still ferocious. 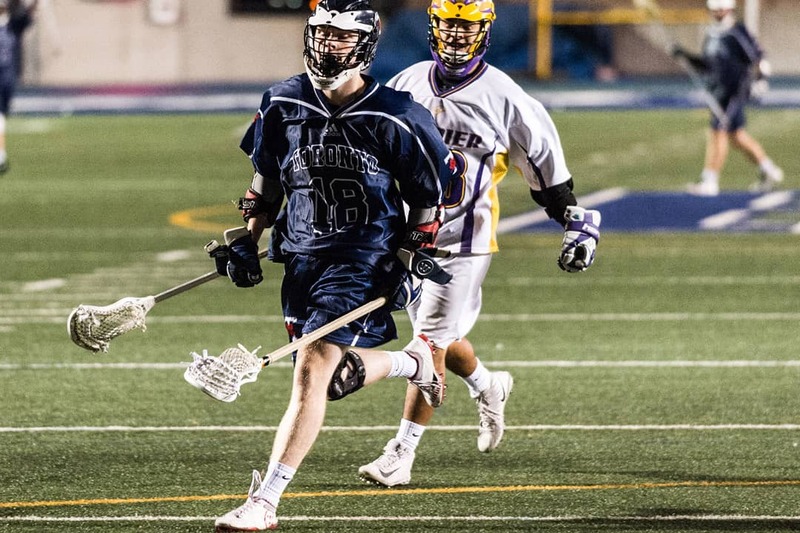 Considered the fastest game on two feet, there is no slow play in lacrosse. It is full tilt and high octane, and at the highest level in the country, the animosity and vitriol is evident. The Blues have an injury list that seems to be growing by the game. On this night, Barney, Blondie, first-year goalie Macon Jeffereys, and I — a fourth-year defensive midfielder — are unable to play. Many of the Blues on field are nursing injuries too, but playing through pain is nothing new. The Blues’ entire roster at full strength is only half of the Mustangs’ dressed roster. Leaden legs chase desperately after the Mustangs, who are two-time defending national champions. Second-year long-stick midfielder James “Chilli” Keane has run ragged into the ground. Play after play, he has hacked, slashed, and stopped one of the most prolific offenses in the league. But in a war of attrition, on this night, the Blues are outmatched. The score ends 21–6. It could have been far worse if not for the efforts of goalie Matt Frola. In the locker room, there is nothing to say. The team knows. They know that simple mistakes lead to goals. That to beat the Mustangs, they needed to play a near perfect game. Tonight wasn’t perfect, not nearly. But it was a lesson, especially of the type of game that the Blues would need to play to win at Baggataway. In professional sports, there is an old adage that says athletes need short memories. Through the highest of highs and the lowest of lows they must keep level heads. But as undergraduate and graduate students, the Blues are not professional athletes, and their spirits tonight are low. Jeffrey Zade is an upper-year student studying molecular biology. With a wicked shot, always low to high, the attackman doubles as the team’s de facto comedian. He gauges the mood on the ride back from London. As the bus rolls through the dark night, past farmers’ fields, construction, and the glare of traffic, Zade slowly but surely lightens the mood. Back in Toronto, the team steps off the bus laughing, eager to continue their journey to Baggataway. It’s Wednesday, September 5, and the Blues are scheduled to open their season against Laurier on Friday night. After a long night of practice, the Blues slow clap and circle up. Water bottles are passed around and ice is given to those in need. They discuss the things that went well, and the things that they need to work on tomorrow. The beauty of practice is that there is always another one tomorrow. “Three more sleeps!” someone calls out, reminding everyone of the coming game and the dawn of this most important season. There’s a lot of laughter, and some shoving, “Two sleeps, you mean?” More laughter, as the team struggles to figure out how many sleeps until the seventh. After an embarrassing few moments, everyone realizes that it is, in fact, two more sleeps. The laughter and camaraderie is what makes the Blues special. Now, for the next two weeks until November 9, the Blues will practice for their 7:00 pm quarterfinal game at Varsity Stadium. Weeks and months of field practice, work in the gym, and for many, years of playing lacrosse for U of T, are coming together for this final weekend of the season. Since August, the Blues have practiced day in and day out for Baggataway. They have practiced and played to make sure that, come November 9, they are ready to lay it all on the line. Baggataway — for the first time in the program’s history.